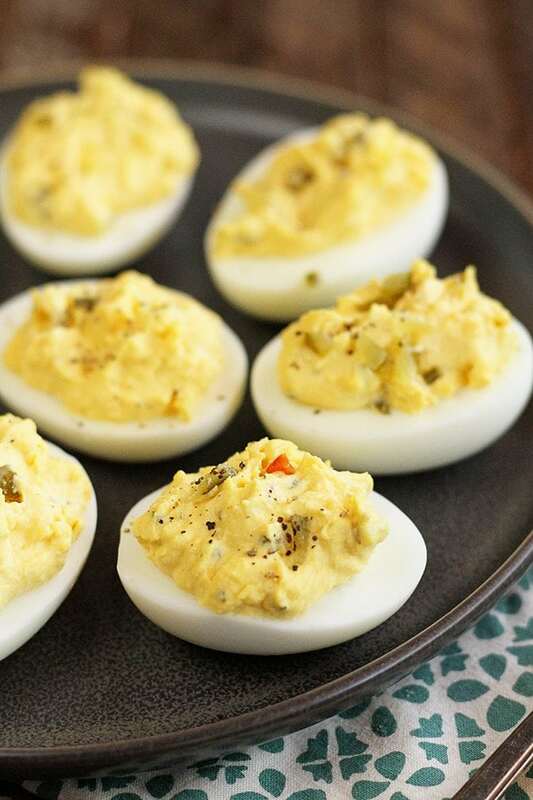 I just love deviled eggs, but for whatever reason, I don’t make them very often. But when Easter rolls around, it’s always the perfect way to use up those leftover colorful eggs. You know, recipes like this are funny because everyone has their own way of making them. 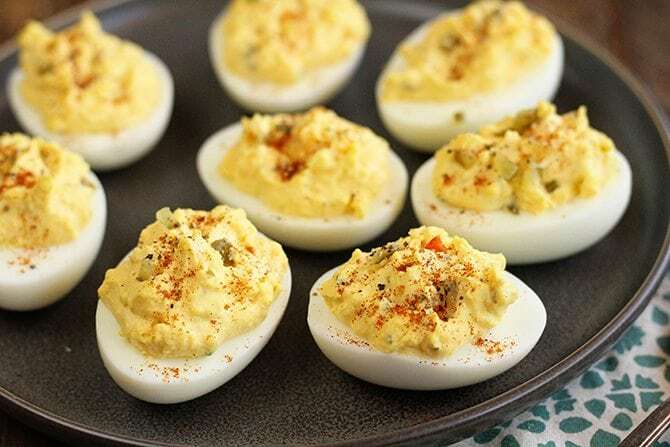 Oddly enough, every recipe I’ve seen and all the eggs I’ve seen that other that other people have made have paprika on them as a garnish, but I never once saw my mom make deviled eggs with paprika. Not once. Now, I always say that the way your mama did it was the right way, so I’m showing them both ways here – some with paprika and some without. The other thing I like in mine that’s a little different is that I prefer dill relish to the much more popular sweet relish. This recipe works with both, but I’ve just never been a huge fan of sweet relish. In fact, when I was a kid, mom would make potato salad for me separately and chop up dill pickles in it rather than sweet ones like everyone else’s. Wasn’t she sweet to do that? The other thing worth mentioning is how to get these eggs cooked. Boiling them is the traditional method, but I’m gonna flip that theory on its ear for a minute. The big hassle for me when making hard cooked eggs is peeling them. Now, I’ve seen (and tried) all the tips and tricks to try to make them easier to peel – using older eggs, adding vinegar to the water, add baking soda to the water, starting with cold water in the pot, etc., etc. For me, none of those work consistently. But you know what does? Cooking the eggs in an electric pressure cooker. While they’re virtually the same thing, I’ve had an electric pressure cooker for years before folks knew anything about an Instant Pot. Pressure cooking the eggs on low pressure for about 8 minutes with a manual pressure release will deliver perfect hard cooked eggs every time and the shell will peel right off. Now, why does this work? Well, the theory is that the steam causes the membrane inside the egg to pull away from the shell making them easier to peel. And that makes sense. But realizing that not everyone has an electric pressure cooker, I found this egg steaming recipe from my friend Elise Bauer over at Simply Recipes. She confirmed that steaming them is the reason they peel so easily. Testing it myself yielded virtually the same results as the pressure cooker method. SO! I wrote this recipe to include the method of steaming the eggs. Give it a try and let me know how it works for you. Feel free to click that link to follow Elise’s recipe as she has much more detail in her instructions. Enjoy! For easy-to-peel eggs, steam them rather than boiling them. To do so, add about 1/2 inch of water to the bottom of a medium-sized saucepan with a tight-fitting lid. Add a steamer basket if you have one, but it's not necessary. Over medium-high heat, bring the water to a boil. Turn the heat off. Carefully add the eggs to the basket or just to the bottom of the pan. Cover and return to a boil. Steam for 12 to 15 minutes. To check the doneness, you might add an extra egg and check it at 12 minutes to judge the cook time. Once cooked, place the eggs in an ice bath until they are completely cool. Peel the eggs and slice them in half lengthwise. Carefully scoop out the yolk and place them in a small bowl. Use a fork to mash up the yolks. Add the mayo, mustard, hot sauce, and garlic powder. Mix until smooth. Add the pickle relish. Add salt and pepper to taste. Spoon the mixture equally back into the whites. Stacey, there must be about a million variations on deviled eggs. I grew up in Texas and maybe that’s why mine is a tiny bit different from yours. My Mother did not put any kind of pickles in her eggs, so I don’t either. 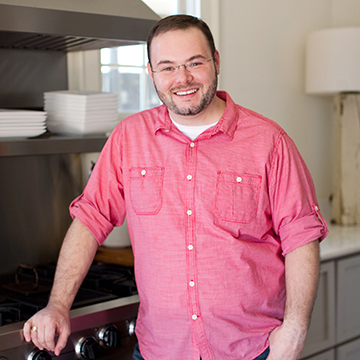 (That solves the question of whether to use sweet or dill.) We use lots of mayo (Hellman’s), dry mustard, salt & pepper and a few years ago I learned to add a little horseradish. 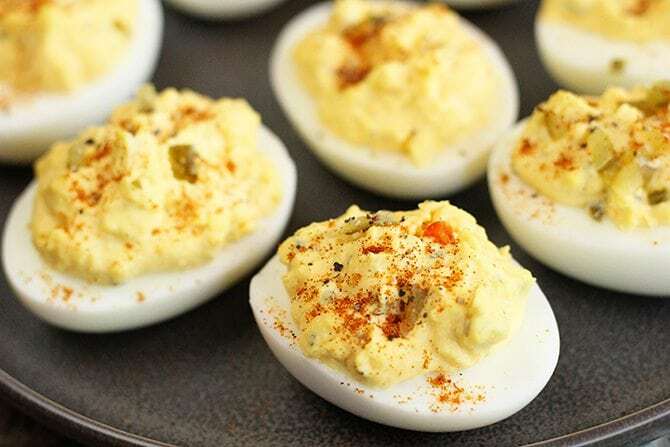 Top the filled eggs with a generous dash of paprika for color. They have some zip! 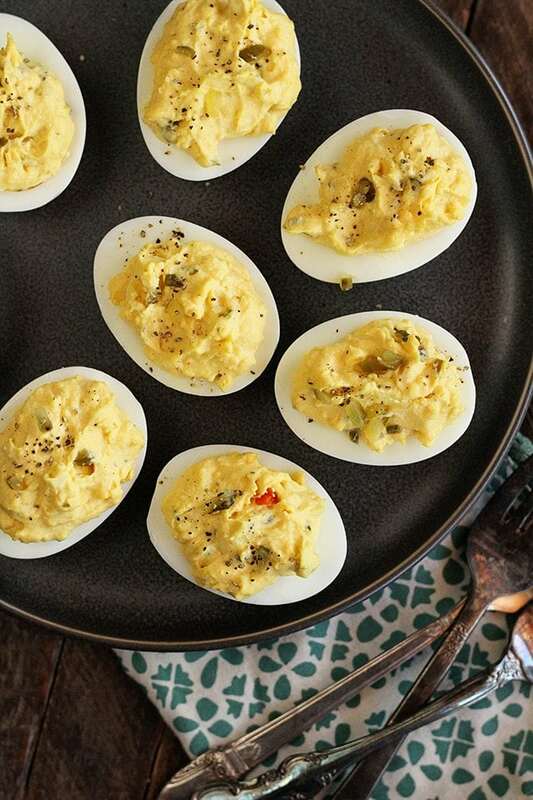 We always have deviled eggs on Thanksgiving, Easter and with any kind of barbecue. 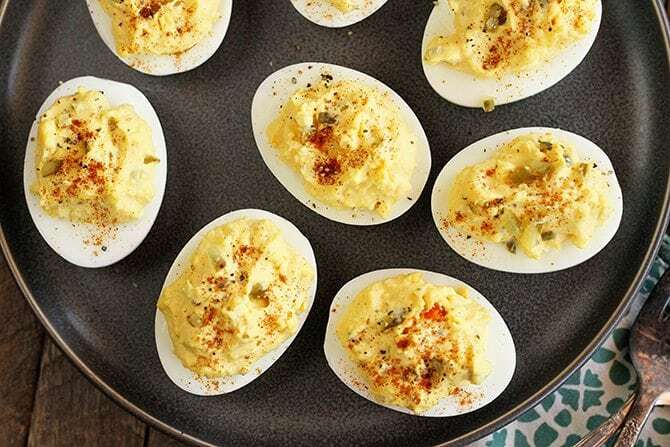 Caution: Deviled eggs may be habit-forming! Agreed! Love hearing all the variations! Stacey! 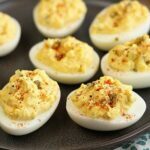 I love me some deviled eggs, but have never made them. I ha e everything I need to make them..so guess what..have eggs steaming as I speak and cannot wait to eat them. You haven’t steered me wrong yet..just love your recipes! I sure hope you’ll enjoy them!!! These were delicious! I had some unexpected visitors..who had the nerve to try them out! Lol..well after they left, I made myself another batch….which I refused to share. The is for the recipe…this is a keeper. SO glad to hear you and your guests enjoyed these! They can be a hassle, but the steaming makes them a little easier for me. I absolutely LOVE your recipes. 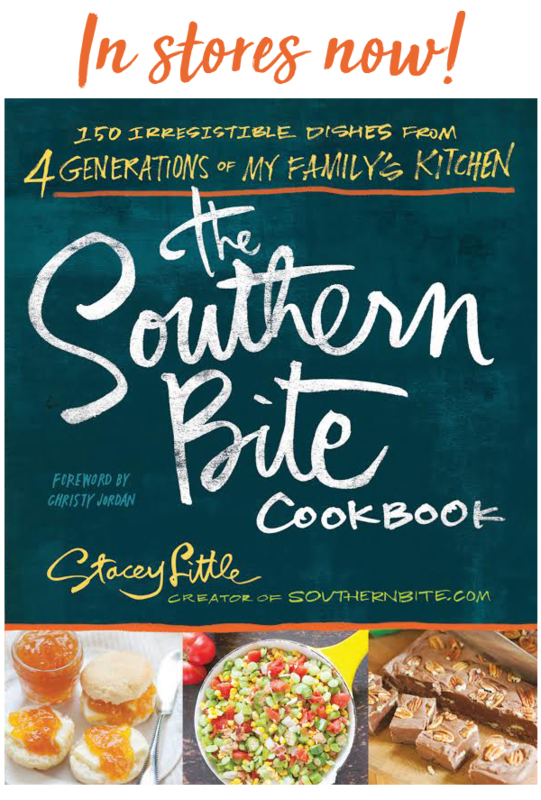 Being from south Alabama, your recipes remind me of many of my grandmother’s dishes. I wanted to know what kind of electric pressure cooker you have? Thank you so much. Thanks, Michelle! I couldn’t ask for a better compliment. I have a Cuisinart electric pressure cooker. When boiling eggs put salt in the water during boiling. When done pour hotwater out … fill with cool water toss in ice cubes till cool and it will peel easily. I’ve not had consistent luck with that but the boiling always works. Stacey, this has worked for me since I tried it last year. I don’t put salt in the water anymore only because I kept forgetting to but it didn’t seem to matter. Pouring out the hot water then quickly adding cold water and ice cubes, then immediately peeling the eggs has been a consistent winner for me anyway. YES! The hot sauce just gives them a little bite, not heat really and the vinegar really adds flavor! When you add the eggs to steam do you turn the heat back on again or just let them sit, covered, for 12 minutes? Thanks! Yep, you’ll return the water to a boil. Enjoy!